Measure 97 (M97) would establish a new gross receipts tax on Oregon corporations. The new tax would charge firms 2.5 percent for all sales in excess of $25 million. If adopted, the tax would raise an estimated $6 billion per biennium, a 25 percent increase in the Oregon state budget. Gross receipts taxes result in tax pyramiding, the process of taxes stacking on top of other taxes as goods are refined in the structure of production. Oregon would join just five other states in assessing a state-wide gross receipts tax, and Oregon’s version would be the most burdensome. It would be the highest rate in the country, save for the tax on radioactive waste in Washington, and the tax would not include provisions to limit its distortionary effects like in other states. The gross receipts tax proposed in M97 is in addition to the corporate income tax, not a replacement. Oregon would fall from the 11th best to the 17th best ranking in the State Business Tax Climate Index, but its corporate tax structure would fall to 50th. Oregon’s corporate tax climate would be the worst in the nation. A ballot initiative primed for the November 2016 ballot could remake the corporate income tax in Oregon. It would assess a 2.5 percent gross receipts tax on corporations with annual sales in excess of $25 million, raising an estimated $5 billion over the biennium. If passed, its effects will be felt by businesses and individuals alike. The tax would add complexity to Oregon’s code, increase economic distortions, and greatly increase the state’s budget. In terms of tax structure, Oregon already has issues with a multi-faceted corporate income tax, levying a traditional income tax as well as a parallel alternative minimum tax on corporations. The proposed gross receipts tax of M97 would stack on top of that structure. Economic research consistently demonstrates the ill effects of gross receipts taxes both in theory and based on case studies where they have been implemented. Gross receipts taxes violate core tenets of sound tax policy, especially neutrality, as similarly-situated firms would be affected differently by this new tax. Oregon’s proposal would be one of the largest gross receipts taxes among other states that have gross receipts taxes, and would greatly reduce the state’s competitiveness. Oregon’s corporate income tax has two tax brackets: 6.6 percent on corporate income less than $1,000,000 and 7.6 percent on income greater than $1,000,000. To ensure that all corporations have a tax liability after deductions and credits, Oregon is one of just eight states that also assesses a minimum tax on top of its income tax. Firms must complete a second tax calculation and remit the greater of the two amounts. The minimum tax is tiered based on sales within the state of Oregon. The payments range from $150 to $100,000 (Table 1). Firms paying the minimum tax comprise the bulk of corporate income tax returns. According to the Oregon Department of Revenue, 71 percent of all corporate returns in 2012 paid the minimum tax, including 95 percent of those with zero income or a loss. However, it is a small amount of the revenue collected, representing 10 percent of corporate income tax collections in 2012. States tend to use three factors, sales, property, and payroll, to determine how much of a corporation’s income to subject to that state’s tax. A ratio of a firm’s sales, payroll, and property in a state is compared to the firm’s total sales, payroll, and property. The corporation’s income is then subject to taxation in the state, based on that ratio. For instance, if a firm has 10 percent of its sales, payroll, and property in a state, 10 percent of its income would be tax subject to that state’s taxation. Oregon uses sales, known as “single sales factor,” to apportion income; only Oregon sales, and not property or payroll, are subject to Oregon taxation. Both the corporate income tax and the minimum tax are assessed on these Oregon-based sales. Measure 97 (M97) seeks to change how the state’s minimum tax is assessed. Corporations with Oregon-based sales greater than $25 million will face a larger minimum tax. For high-sales firms, the new tax would raise the minimum tax from $30,000 to $30,001 plus 2.5 percent of all sales in excess of $25 million (Table 2). Under this structure, the new minimum tax will functionally replace the Oregon corporate income tax for high-sales firms. Charging 2.5 percent of revenues above $25 million will surely be greater than 6.6 or 7.6 percent of net income. The tax will quickly increase tax bills for firms, producing a flood of new revenue for the state. The tax’s overly broad base will subject numerous transactions to the tax, hitting many more than the income tax ever could. The Oregon Legislature Research Office estimates that the new tax will raise between $2 and $2.5 billion a year, or approximately $5 billion for the biennium. The corporate income tax currently raises $1.135 billion per biennium. This proposal would thus be a 440 percent increase in corporate tax collections. An estimated 1,000 businesses will be affected by the change. Based on Oregon Department of Revenue data, almost half of these businesses would have between $25 and $50 million in Oregon sales. If passed, the tax will have large economic effects. The public finance literature resoundingly finds that gross receipts taxes are highly destructive taxes. The first issue scholars raise is that gross receipts taxes lead to tax pyramiding. Tax pyramiding occurs when an item is taxed multiple times as it moves through the production process. Each time it changes hands and is taxed, the cost of the good increases. In short, a tax is assessed on a tax. This differs from a sales tax where the tax is only charged on its final sale. Figure 1 demonstrates how pyramiding would occur in the production of milk. Under a sales tax, the tax is only assessed when the pasteurized milk is sold to the final consumer. 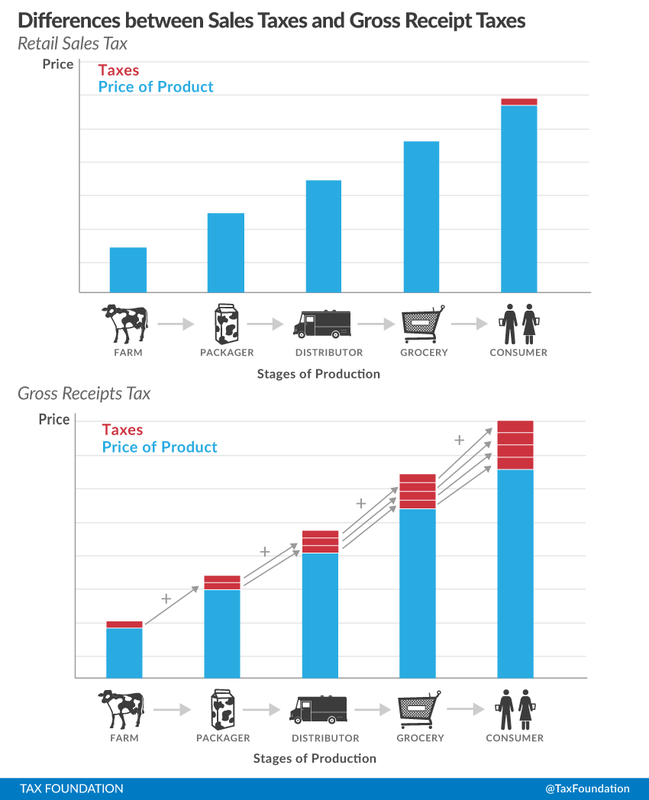 With a gross receipts tax, a tax is assessed multiple times as the milk moves through the supply chain. Each level of production results in a new tax liability, increasing due to tax pyramiding. Under the Oregon proposal, if the milk came from a farm, packager, or distributor with sales in excess of $25 million, the price of milk would increase as the gross receipts tax is assessed. The several previous levels of taxes would get added to the wholesale price. The milk would be more expensive than it otherwise would be. To offset the higher cost of milk, a grocery would confront several difficult choices as it decides how to offset this increased tax to stay in business. The store might consider increasing the cost of milk, meaning families would then pay more. It might decide to hire fewer employees or trim benefits, meaning workers would be affected. The store might withhold dividend payments from its shareholders, and that would hurt retirees and investors that use the dividends as a source of income. The downstream effects of this type of tax pyramiding can be significant. The state of Washington analyzed its gross receipts tax, called the Business & Occupation (B&O) tax, to quantify the amount of tax pyramiding that was occurring due to their tax. They found that taxes pyramid on average 2.5 times under the B&O. The hardest hit industry, food manufacturing, had a pyramiding rate of 6.7 times. Gross receipts taxes burden industries differently. Industries with longer production schedules or with larger supply chains face a higher effective rate than other similarly-situated firms. The tax pyramiding becomes more pronounced as the supply chain increases in length. Firms that are vertically-integrated escape the multiple levels of taxation; the tax encourages a firm to vertically integrate, even if it is not the optimal firm structure. Similarly, given that only firms with sales in excess of $25 million would be affected, retailers and other high-volume industries would bear a disproportionate burden of the tax. Taxes should be neutral in their treatment, meaning that they affect industries equally. This tax will be non-neutral in its treatment. In addition to tax pyramiding, a gross receipts tax unfairly harms businesses with little or no profit. Under an income tax, firms with no profit would pay no tax. This protects firms that are experiencing hardships or just starting up. A gross receipts tax would require a firm with no profit to continue to pay taxes, and the bill is sizeable. Firms that can least afford the tax bill will be hit with larger bills than otherwise. This could speed up the time that it takes for a company to fail or close. M97 will only hit those firms with sales above $25 million, and who are organized as C corporations, but other businesses could feel the effects too. Input costs could increase if their vendors are affected. Small businesses purchase goods or services from larger firms with direct tax liability, which could raise costs for those small businesses. For instance, electricity costs could be higher, causing the small business to allocate more resources towards paying for this necessary input. 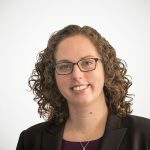 The Oregon Legislative Revenue Office (LRO), a nonpartisan legislative research agency, has issued findings on gross receipts taxes that are similar to other pieces in the public finance literature. They have not released a specific report on M97, but have issued three reports in recent months on gross receipts taxes and their effects on Oregon. More specifically, it found that private sector employment would decrease by 15,022 jobs with an increase of public sector jobs by 6,004 for a net job loss of 9,018 in the state. The report emphasized that the retail and manufacturing industries would shed the most jobs, losing more than 5,600 employees. Further, agriculture and natural resources would have the largest decrease as a percent of its total workforce. LRO estimated that employment in that sector would decrease by approximately 1.3 percent. LRO additionally reported that personal income would decrease by $344 million, and household income would decrease by $799 million. All told, the LRO analysis found that a 0.4 percent gross receipts tax would raise $1 billion in 2017, or $2 billion over the biennium, much less than M97, but still a dramatic increase over the current corporate tax structure. Analysis of M97 is likely to show many damaging economic effects, as the rate is magnitudes higher than 0.4 percent, and the tax will raise 2.5 times the amount of revenue. The third LRO report was in response to a proposal floated by Senate Finance and Revenue Chair Mark Hass, who proposed an M97 replacement during the 2016 legislative session. According to the Senator’s office, the proposal would have repealed the state’s corporate income tax and instituted a gross receipts tax of 0.39 percent on sales of greater than $1 million. It made a few changes to the personal code as well, including an expansion of the state’s Earned Income Tax Credit and standard deduction which benefits filers with incomes below $34,311. It would increase state revenues by $249 million in 2017. LRO found that this proposal would also reduce personal income in Oregon, particularly for filers with greater than $34,311 in income. It would, however, increase employment by 4,454 jobs, but the large share of those would be public-sector employees. LRO is expected to release analysis on M97 in the coming weeks. These three reports give us a glimpse into what that report will say. LRO will likely find that M97 is an exceptionally burdensome and destructive tax. 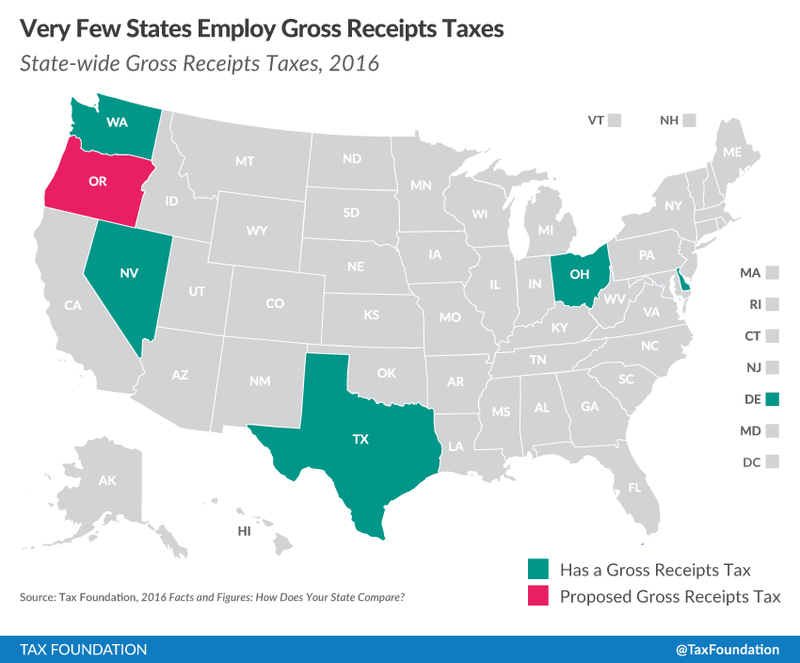 Five states, Delaware, Ohio, Nevada, Texas, and Washington, assess a state-wide gross receipts tax (Figure 2). Oregon’s proposal differs from many of these other states. First, some states with a gross receipts tax, like Washington or Nevada, try to mitigate some of the disincentive effects from their gross receipts tax by varying the tax rate by industry. The B&O in Washington has 31 rates, while the Commerce Tax in Nevada has 26 rates. Higher profit industries or those with more vertical integration are subject to a higher tax rate than lower profit industries. This is an attempt to make the tax more neutral, but sacrifices simplicity in the process. Other states, like Texas, allow for deductions for the cost of goods sold or for employee compensation. The tax is then due on a more equitable tax base than all sales. This moves the gross receipts tax closer in structure to a corporate income tax and limits some of its economic distortions. The Oregon proposal does neither of these things. The rate of 2.5 percent would apply to all businesses with sales above $25 million with no consideration for industry structure. The proposal does not allow firms to deduct input cost. Oregon’s proposal would be the truest type of a gross receipts tax. The Oregon rate is much higher than many other gross receipts taxes too. Delaware charges between 0.0996 and 0.7468 percent. Ohio charges 0.26 percent. Only Washington’s Business and Occupation tax has a rate that is higher, 3.3 percent, but that rate is only assessed on radioactive waste disposal. Retailing is taxed at 0.471 percent and wholesaling is taxed at 0.484 percent. Many other states have repealed their gross receipts taxes in recent years, largely because of the tax’s ill effects. Indiana repealed its gross receipts tax in 2002, New Jersey repealed its tax in 2006 after only four years, and Kentucky’s gross receipts tax only lasted a year before it was repealed. Michigan repealed its infamous Michigan Business Tax in 2011. Oregon’s corporate tax structure is already uncompetitive. The state ranks 11th best overall on the State Business Tax Climate Index, but is buoyed by its strong performance on the sales tax and property tax variables. It currently ranks 37th among the 50 states on the corporate income tax subcomponent. If this proposal is adopted, Oregon will fall to 50th on the corporate income tax subcomponent and 17th overall, and the proposed gross receipts tax will give Oregon the worst corporate tax climate for businesses in the country. The tax proposal included in M97 fails to meet many of the tenets of sound tax policy. It is not neutral, and it is not equitable. It will lead to significant tax pyramiding and higher costs for consumers. Unlike other states with a gross receipts tax, Oregon’s proposal does not try to mitigate its distortionary effects. Instead, it would create a gross receipts tax with the highest rate in the country, except for the rate charged on radioactive waste disposal in Washington State. If adopted, Oregon’s corporate tax system will become the least competitive among the 50 states. Oregon calls its corporate income tax the “corporate excise tax,” but it is an income tax. Jared Walczak, Scott Drenkard, and Joseph Henchman, 2016 State Business Tax Climate Index, Tax Foundation, September 2015, https://taxfoundation.org/article/2016-state-business-tax-climate-index, at 64. Oregon Department of Revenue, “Oregon Corporate Excise Tax and Income Tax: Characteristics of Corporate Taxpayers,” 150-102-405, January 2015, Exhibit 3.15. Oregon Secretary of State, Initiative Number 28, http://egov.sos.state.or.us/elec/web_irr_search.record_detail?p_reference=20160028..LSCYYYA_BETTER_OREGON. Christopher Allanach, Legislative Revenue Office, e-mail message to author, December 4, 2015. Washington State Tax Structure Study Commission, “Tax Alternatives for Washington State: A Report to the Legislature Volume 2”, November 2002, Table 1, http://dor.wa.gov/content/aboutus/statisticsandreports/wataxstudy/volume_2.pdf. Andrew Chamberlain and Patrick Fleenor, “Tax Pyramiding: The Economic Consequences of Gross Receipts Taxes,” Tax Foundation Special Report No. 147 (Dec. 4, 2006). https://taxfoundation.org/article/tax-pyramiding-economic-consequences-gross-receipts-taxes. Legislative Revenue Office, “Analysis of Options for Restructuring Oregon’s State and Local Revenue System,” Report #4-15, December 2015. Legislative Revenue Office, “Impacts of a Broad-Based Gross Receipts Tax,” Testimony before the Senate Interim Committee on Finance and Revenue, January 13, 2016. Legislative text for this proposal was not drafted or released as it originated in the Oregon Senate. All descriptions of the plan were provided to the Tax Foundation from staff of Senator Hass. Legislative Revenue Office, “Tax Revenue Alternative,” January 28, 2016. This was provided to the Tax Foundation from Senator Hass’s office. Washington Department of Revenue, “Business and occupation tax classifications,” accessed April 11, 2016, http://dor.wa.gov/Content/FindTaxesAndRates/BAndOTax/BandOrates.aspx. Tax Foundation, Facts & Figures 2016: How Does Your State Compare?, Table 18, February 29, 2016. Scott Drenkard, “The Texas Margin Tax: A Failed Experiment,” Tax Foundation Special Report No. 226 (Jan. 2015), https://taxfoundation.org/article/texas-margin-tax-failed-experiment. Joseph Henchman, “Michigan Governor Signs Business Tax Changes,” Tax Foundation Blog, May 26, 2011, https://taxfoundation.org/blog/michigan-governor-signs-business-tax-changes.